We are reaching the tail end of this series of posts; we’ve covered most of the major characters and this post and its successor will cover the straggler characters – the Ironborn, Davos, Brienne and Sam. As I mentioned at the end of the last post, I don’t have a great deal to say about any of these characters but I’ll do a quick round-up instead of where this season left them and share some thoughts on where I think they will end up . Supporting characters like these end up being some of the greatest victims of the narrative pressure as we head towards the end game. There simply hasn’t been time to build the stories of these characters; Sam’s story has been probably handled the best of the side characters’ but even that felt a little rushed. I don’t see this changing much in Season 8; indeed, I wouldn’t be surprised to see chunks of the cast get dropped for most of the season beyond some token appearances. I am convinced that Game of Thrones did not know what to do with the Ironborn. Right since their introduction, it seems that the people of Westeros have been content to let the Ironborn do whatever they like. When Balon raised his banners in revolt, he went after the Starks – Theon, to everlasting regret, went even further. Yet, after the fall of Winterfell and its subsequent recapture by the Boltons, it seems that none of the surviving powers ever felt the need to put the Ironborn in their place. Even before the Ironborn made their deal with Cersei, why did the Tyrells or the Lannisters see a need to deal with the Ironborn. In fact, what were the Ironborn even doing after Theon lost Winterfell? In the books, they spent a lot of time just being a pain to many of the coastal cities along the western shore of Westeros; Oldtown, Lannisport too, if memory serves. In the books, dealing with them is certainly high on Tywin’s, and later, Cersei’s agenda. Pyke – A Winter Wonderland? 1.) Will this be a story of Theon overcoming all the obstacles both inflicted and self-imposed to rescue Yara or will Euron have the last laugh? 2.) Regardless of the outcome, what does that mean for the rest of the plot? Regarding the first question, I honestly don’t have much of an opinion. I just can’t see where the Ironborn story – particularly Theon and Yara’s is going. I reject the idea that Euron is going to be the last Ironborn standing – if that was the writers’ goal, then that could have been much more easily accomplished at the beginning of the season when the two factions were fighting. No, I don’t think that even Game of Thrones is cynical enough to have someone like Euron come out on top. So where is this meandering Ironborn story going? Well, I think the Ironborn storyline has always been defined by Theon’s journey. Theon’s journey has been one of the better examples of character development in the series; his initial arrogance and insecurity first being broken down by Ramsay’s atrocities only to then be replaced by true strength and moral fiber. I was disappointed to see him break again in the face of Euron’s ruthlessness, but encouraged to see him return to rescue Yara. ‘What is dead may never die, but rises again harder and stronger’, indeed. My first theory here is that Theon and/or Yara reforge the Ironborn identity after defeating Euron. We already see Theon suggesting it at the end of Season 7. The Ironborn have never really meshed well into the civilized societies of the mainland; partly for economics reasons but largely due to cultural ones as well. Perhaps Yara and Theon can change that and bring some much-needed social and economic reform to Pyke. Truth be told, while I say Theon and Yara, I very much doubt it will be both. In the books, it seems that Yara wants to rule through Theon, in the series, I think Yara will die in Theon’s hands, making him the last of the Greyjoy line and with his inability to reproduce, the Greyjoy line ends with him. My second theory however, is that it will be Theon who dies, fighting to save Yara and in doing so finally redeeming himself in his own eyes for all his many sins. 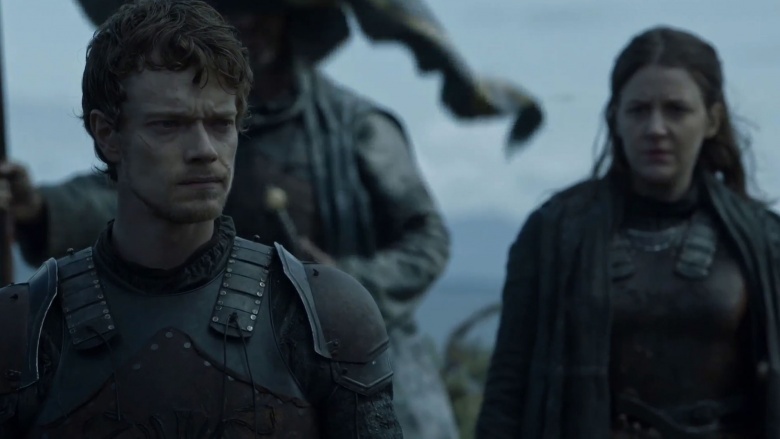 Theon’s character has struggled between the cruel political pragmatism of his Greyjoy lineage and the honourable nobility of his Stark upbringing. Perhaps in Season 8, we will finally see him reconcile the two and that could just as easily be the high point of his character; I wouldn’t mind if he went out on such a high. As for what any of these three outcomes (a. Theon and Yara win, but one of them dies, b. Theon and Yara win and live or c. Euron wins), means for the plot, it is really hard to say. I just don’t know what role the Ironborn navy has left to play; perhaps, if they win over Euron they can help evacuate the mainland? I don’t see it happening and even if it did where would they go? Perhaps, the Ironborn can take advantage of their naval mobility to deposit a group of ragtag soldiers performing a very specific precision strike on the enemy? If Euron is the one that wins, I can see that being a factor locking down Dany’s forces and limiting their effectiveness in fighting the Others but whether ships can really hold out against even two dragons remains to be seen – Dany made short work of a fleet in Slaver’s Bay at the end of Season 6. We have certain built up a large stable of side characters over the last 7 seasons. Podrick, Gendry, Bronn, Dolorous Ed, Jorah Mormont, Beric Dondarrion, Davos Seaworth, Brienne of Tarth; are all examples of characters whose arcs remain ambiguous at best. For a couple of them, I’m not even sure if we will see them again – I don’t know why Gendry was reintroduced, and I don’t know what use Podrick will be in the next season. For others, like Bronn, Beric, Davos and Brienne, I suppose I can see some sort of purpose for them but nothing clear-cut and due to how tangential their characters’ arcs are to the main story, even if their personal arcs do not get a clear resolution, I doubt it would matter much. Davos in particular has been something of a lost puppy. When he was introduced, he was shown to be Stannis’ most staunch follower, loyal to a fault, willing to follow him into any situation. Naturally, with the character assassination job that Season 5 carried out on Stannis, Davos finally realized he was in an abusive relationship and left Stannis for Jon. I don’t think that that transition from Stannis to Jon was handled well. It still seems strange to me that Davos is so committed to Jon’s cause. After Stannis’ death, I understand that Davos got caught up in the events at the Wall but once Jon was brought back, I don’t see what incentive Davos has to serve him. Davos doesn’t know Jon and even if does see Jon as this better, more honourable version of Stannis, that realisation came too soon and too easily to Davos, for my tastes. It’s been pretty clear that Davos will not be fighting on the frontlines. He is a capable enough administrator, I guess and a loyal adviser. I could see him serving Dany or Sansa depending on who Jon assigns him to. I can even see him taking up a position post-season 8 as something like Master of the Ships or Master of the Coin. However, during the season itself, I can’t really see what his purpose is going to be. There is one particular reunion that could be interesting however; we know that Melisandre will be returning to the narrative and it’s unclear whether it will be Arya who kills her or Davos. Both characters have the motive and while Arya has more of a means, Davos might be the more motivated. It will be interesting to see if he can let Shireen go after all this time. Compared to Davos, Brienne has had a shorter journey, having been introduced after the rest of the characters featured in this post. Her journey, while going in a very different direction from her character’s journey in the books, is more or less on par with what I expected it to be. Her story has been a gender-flipped version of the classic knight’s story, a gallant individual struggling to reconcile the lessons of honour she was taught with the complicated honourless reality around her. In the books, this struggle was much more explicit; her choice between Jaime and Catelyn showcases her final resolution to this quandary. In the show, the struggle is not emphasized as much; her decision to pursue revenge for Renly instead of performing her duty in watching out for Sansa did not lead to any negative consequences. It is hard to learn lessons when your actions don’t have consequences. 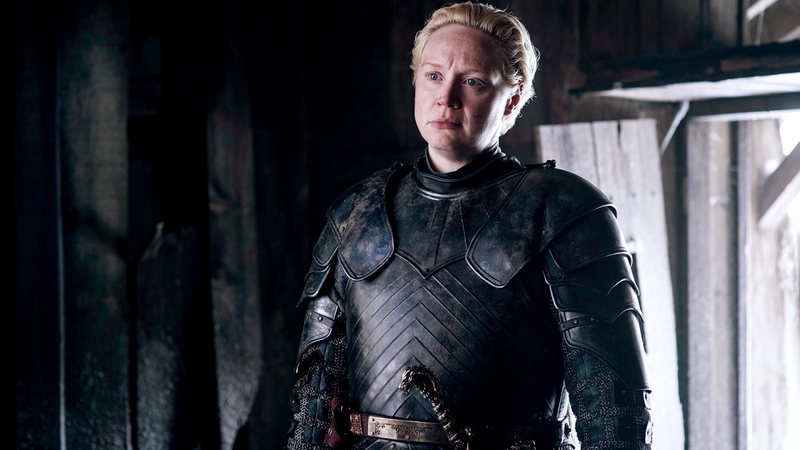 Since then, Brienne’s character has just trotted along; after meeting with Sansa and bringing her to the Wall, Brienne has more or less faded into the background to some kind of extension of Sansa’s will. She goes where Sansa commands but there doesn’t seem to be much of a story left to her at all. For a brief while, I wondered if anything would come out of Jaime and Brienne’s brief reunion at the end of the Season 7. If there had been even a little bit of a conversation, that could have set something up for a further evolution of their relationship in Season 8 but as things stand I don’t know if they will ever talk to each other again even if they are now fighting for the same side, technically. Brienne is more like to serve as Sansa’s enforcer and councillor, especially if matters take a more militaristic turn. Catelyn once called Brienne a knight of the summer; perhaps with the experiences that she has gained since then, that might no longer be the case. And then, last but not least, we have Samwell Tarly, Martin’s self insert into the story. 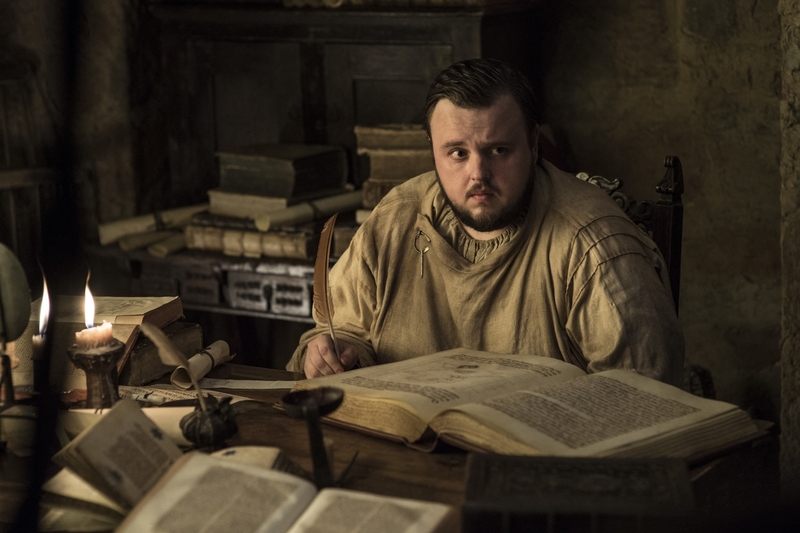 I’ve always been ambivalent to Samwell; I don’t have anything against him, and his POV chapters were generally interesting to read (those in A Feast For Crows aside) but I’ve never quite gotten what all the Sam fuss was about. His role in the story is pretty unclear; I don’t see why he needed to go to the Citadel in the first place, for example. To cure Jorah? Maybe, but then why did Jorah need to get Greyscale in the first place? It hasn’t seemed to change anything about him at all. Did Sam need to go to the Citadel to learn about the Others – not really, since he hasn’t learned anything that we didn’t already know. Did he go so that the characters could learn of Jon’s Targaryen heritage? Well, Bran already had that covered. My point is that I just don’t know what Sam’s role in this story is going to be from here on out, because I don’t know what to think of what his role in the story has been. Maybe there will be some vital piece of knowledge buried away in the old tomes that Sam stole, or maybe not. The way I see it, the side of the living have all the knowledge that they currently need to defeat the army of the dead. If Sam reveals that there is yet another weakness that the living can exploit, then the Others go from being this unstoppable juggernaut to being an extremely fragile group. As it stands, the reveal that killing the original Night King would have been enough to stop the whole invasion left a poor taste in my mouth; it made victory a lot easier, maybe even too easy in a way. Obviously, we will need to see how the various living factions react but the way I see it, having a clear path to victory at this point cheapens the narrative a little. Getting back to Sam, however, I just can’t see what role he will play in this season. He could be an advisor to Jon perhaps, Jon’s personal Maester – a role that he has been playing unofficially since the first season – but beyond that, I just don’t know. Thoughts on this would be very welcome. Almost there – just two more posts. Melisandre, The Hound, Jorah Mormont, the Wildlings. Then a big wrap-up that I’m really looking forward to in which I try to guess what happens in the next season, a true, honest to god prediction post. Thanks for reading!